Do you have a crack in your windshield? If it is out of your line of sight, it may not bother you. You might think it is not important enough to have it fixed. However, regardless of where the crack is located, you should consider having a Houston windshield repair. While you are not in imminent danger of having your windshield break apart, a fender bender or worse could cause the airbags to deploy. That can spell trouble if the crack is in the area of your windshield that your airbag system uses as a backstop when it is triggered. Not all airbags function this way, but yours might. It would be a good idea to ask a qualified auto glass technician to be certain. If the windshield is already cracked, the airbag can break it. Then, the airbag would deploy through the broken windshield. That would leave you and your passengers with no protection against hitting the dashboard or being ejected from the vehicle. 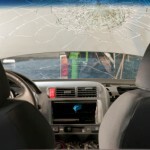 There is no way to determine if your cracked windshield can withstand the force of an airbag. For safety’s sake, it is wise to go to a Houston auto glass company to have it replaced or repaired if possible. Your windshield also helps to hold your vehicle together in the event of a rollover accident. Some estimates say that up to 60 percent of the structural integrity of your roof depends on your windshield. If it is already cracked, a rollover can collapse your roof. If the windshield is not cracked, the force of rolling over will probably crack it, which will absorb some of the impact and prevent your roof from collapsing. 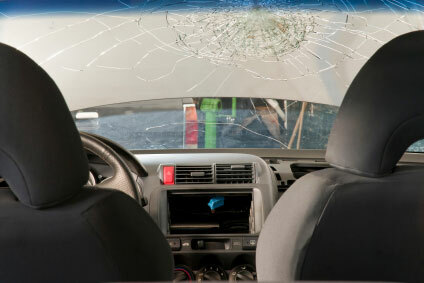 A Houston windshield replacement is definitely recommended if the crack is in your view while you drive. Insurance companies require that you replace your windshield if it has a chip or crack that hinders your view. If the crack is located on the passenger’s side, it should still be repaired to maintain the structural integrity of your vehicle. If your windshield is cracked, there are some things that you should not do. Do not run your defroster until you have already slowly warmed the windshield. Before you turn on the defroster, let your car idle for five minutes so that it gets up to temperature. If you blast hot air at a cold, cracked windshield, the crack may expand. It is also a good idea to have any cracks repaired before the onset of cold weather. You should also refrain from blasting the air conditioner during the summer. The inevitable expansion and contraction of the glass can weaken it. Avoid extremes in temperature. You should not drive your car if the windshield is cracked. The crack can lengthen, which could cause the windshield to unexpectedly break. You might also get a ticket for driving with a broken windshield. Washing your car can make a crack grow. It is possible that your windshield would break even at a drive-through car wash. Have the windshield replaced first. Do not jolt your vehicle or slam the doors. Your small crack might become a large one. Drive over potholes and speed bumps carefully. Have your windshield repaired or replaced if it is cracked. Your safety depends on having a strong windshield that was properly installed. Have an auto glass technician do the job so that you can be assured that the work is done correctly. Apple Glass Company has been in business for more than 25 years. We are auto glass experts. If you are in Houston, call us at 713-680-1400. Residents of The Woodlands can contact us at 281-296-0600. This entry was posted in Windshield Repair and tagged Houston Auto Glass, Houston Windshield Repair, Houston Windshield Replacement. Bookmark the permalink.